Guess Where Eric Holder Works Now? You can tell a lot about a man, not by the position he serves in government, but the position he serves after he leaves government. If there was any question about where Eric Holder’s allegiances lie, look no further than his new job to clear that confusion right up. After failing to criminally prosecute any of the financial firms responsible for the market collapse in 2008, former Attorney General Eric Holder is returning to Covington & Burling, a corporate law firm known for serving Wall Street clients. The move completes one of the more troubling trips through the revolving door for a cabinet secretary. 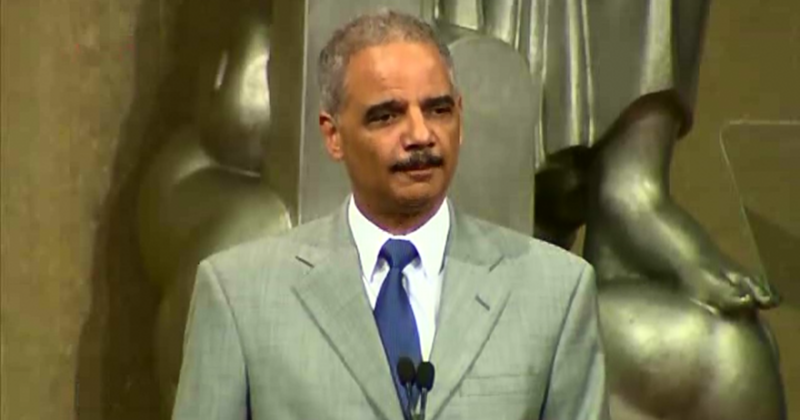 Holder worked at Covington from 2001 right up to being sworn in as attorney general in Feburary 2009. And Covington literally kept an office empty for him, awaiting his return. Of course, a look at Eric Holder’s record as Attorney General reveals that he was the king of corporate welfare and special deals all along. The Department of Justice under Holder not only failed to pursue criminal prosecutions of the banks responsible for the mortage meltdown, but in fact de-prioritized investigations of mortgage fraud, making it the “lowest-ranked criminal threat,” according to an inspector general report. For insiders, the Holder decision to return to Covington was never a mystery. Timothy Hester, the chairman of Covington, told the National Law Journal that Holder’s return to the firm had been “a project” of his ever since Holder left to the join the administration in 2009. When the firm moved to a new building last year, it kept an 11th-story corner office reserved for Holder. Holder’s big move is an embarrassing smack in the face to Democrats who have been attacking big banks and Wall Street since the financial crisis. I would expect they sweep the news under the rug and pretend it’s not happening, kind of like when top officials in the Obama White House left to join BP, or when the White House hired well over a baker’s dozen of former Goldman Sachs employees. Next articleCan Police Take Your Car and Money for No Reason?